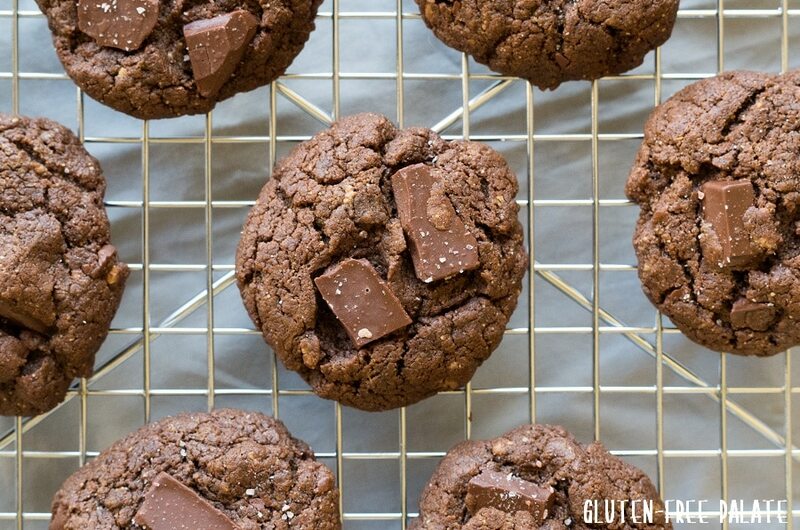 Gluten-free Chocolate Sunflower Seed Butter Cookies that are ultra-soft, brownie-like, and extra fudgey. The perfect cookie, right? 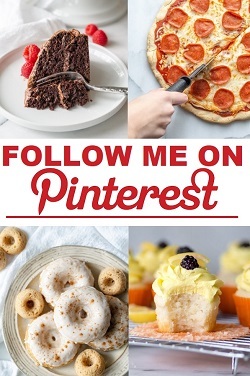 This recipe originally was posted in September of 2014. 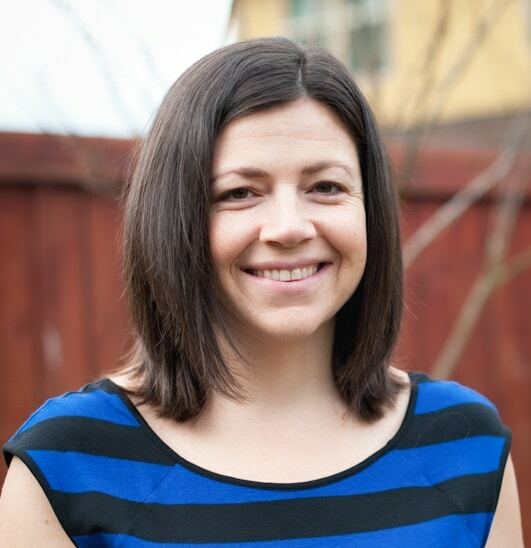 I recently updated the photos and re-shared them. 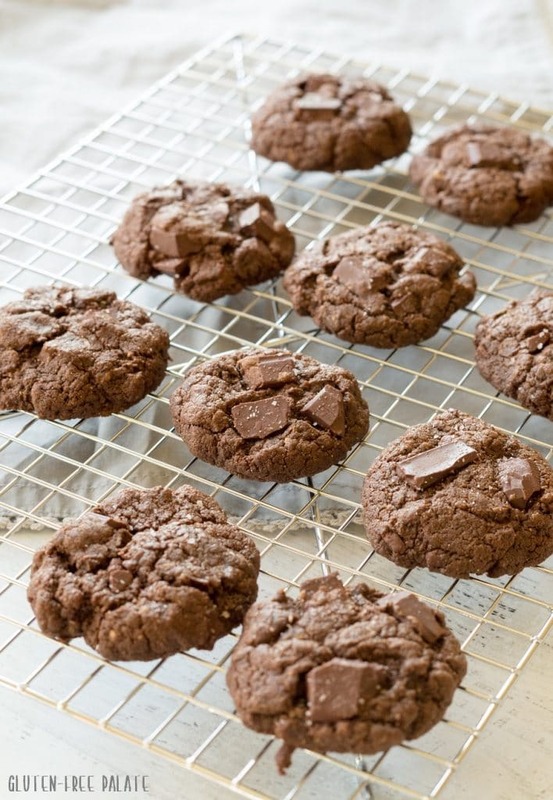 These cookies are gluten-free, grain-free, dairy-free, and nut-free and they taste incredible. You guys are going to love how easy they are to make. A few years back almond butter was recalled in my area. With my youngest being intolerant to peanuts, we turned to sunflower seed butter. Up until that week, I had never really baked with sunflower seed butter – but I’m glad I started. Sunflower seed butter is such a great source of protien, and it tastes great. These Gluten-free Chocolate Sunflower Seed Butter Cookies have been a huge hit with my family since I developed the recipe for them. Sunflower seed butter is a great substitution in recipes for other nut butters like almond butter and peanut butter. 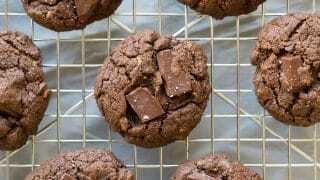 It’s also great for making flour-free cookies, like these Gluten-free Chocolate Sunflower Seed Butter Cookies. So far I’ve used Sunflower seed butter to make my Gluten-Free Chocolate Chip Peanut Butter Cookies, and my Gluten-Free Sunflower Seed Breakfast Cookies. It worked wonderfully in both recipes. 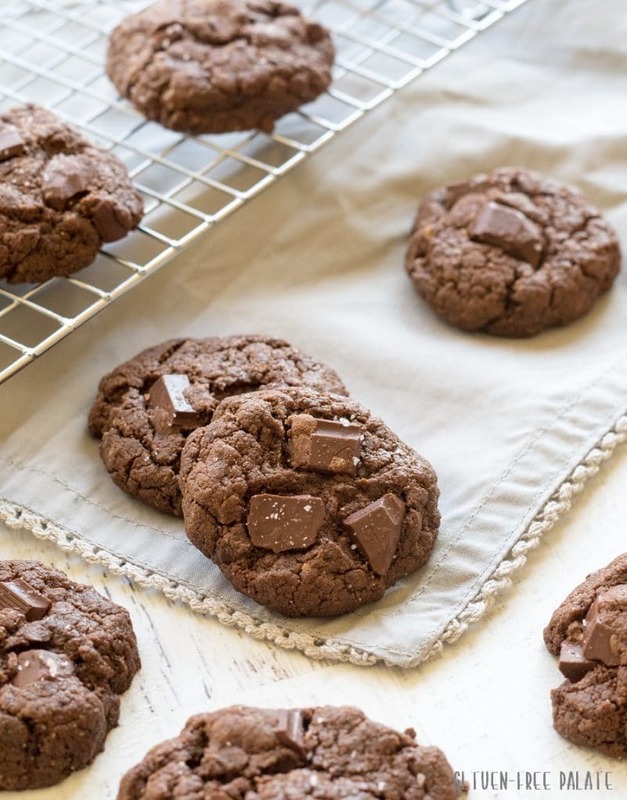 These Gluten-free Chocolate Sunflower Seed Butter Cookies are super simple to make. If I had to describe them in one phrase, it would be death-by-chocolate – but in a healthy way! 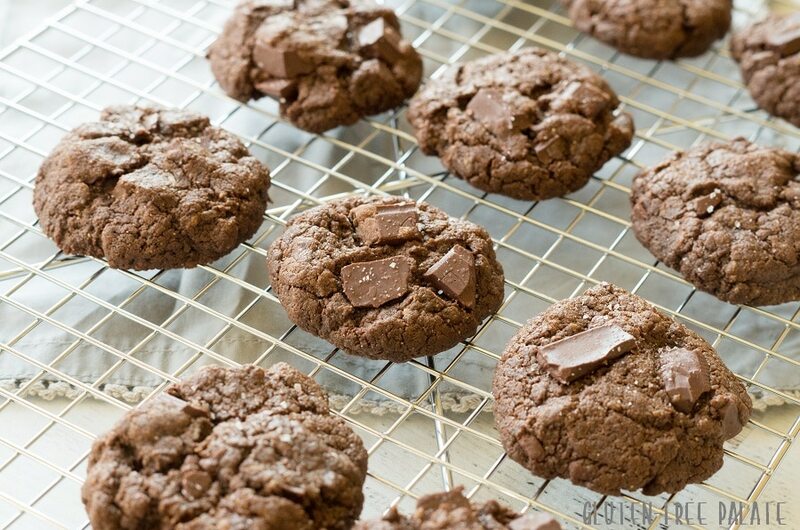 They are rich, tender, chewy and they will satisfy any chocolate craving. If you don’t have access to sunflower seed butter, you can substitute with almond butter. What is your favorite way to bake with Sunflower Seed Butter? In a medium mixing bowl, mix sunflower seed butter, coconut sugar, and egg. Add cocoa powder, and baking soda, and mix until incorporated. Depending on how thick your sunflower seed butter is, you may need to work it with your hands. Work in the chocolate chips or chopped chocolate until evenly incorporated. Form 18-24 small cookie dough balls and place them 12 at a time onto your cookie sheet, 2-inches apart. Press down lightly on each cookie to form a circle. Bake from 8 to 10 minutes, or until set. Remove from the oven and gently slide the parchment paper onto the counter. Line your baking sheet with new parchment paper and bake the last 12 cookies. Let cool completely before removing from the parchment paper. Store in an airtight container at room temperature for up to four days. these look so good! I wouldn’t have thought of using sunflower seed butter 😉 very different and sounds delicious! yum! Thanks Michele! There was a shortage of Almond butter in our area because of the recall and my youngest is intolerant to peanuts as well as gluten. It was a great substitution and she was super happy to have a rich and yummy dessert. I have to use sun butter because my son can’t have almonds due to sals. I made these but they don’t look like yours and they’re very crumbly. I’m sorry to hear that. I’ve never had them come out that way. Did you make any substitutions? These are amazing. Texture is what I remember peanut butter cookies being like. Yes, a little crumbly but SO delicious. My family was fighting over the last one! I used homemade sunbutter and maybe if I add more oil to it, they will be more moist. Either way, no one at my house is complaining. This is the first successful cookie I have made in 3 years. Thank you so much. I’m so glad you liked them. Thank you for letting me know. These are delicious. 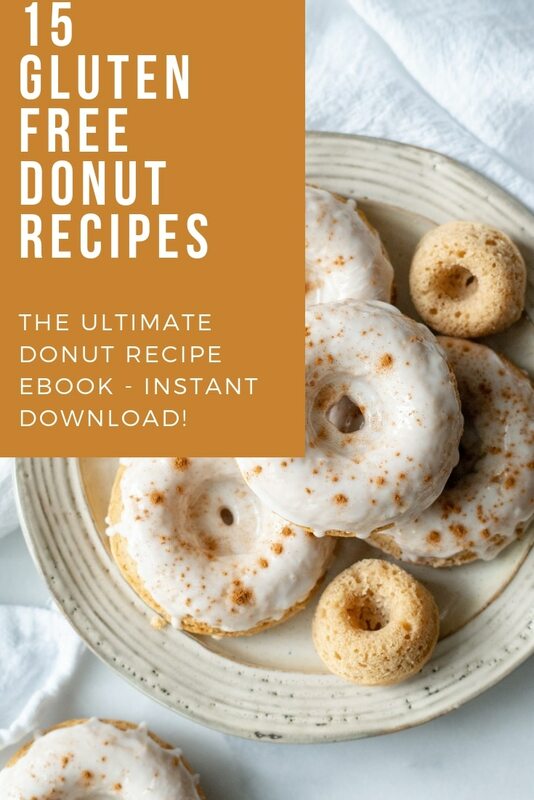 They’re quick & easy to make with ingredients I always have on hand. Mine were only slightly crumbly but they’re so good it doesn’t matter! Thank you so much for letting me know you liked them!